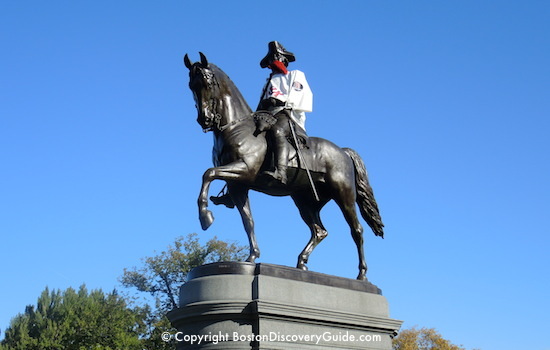 Where to Find Boston Statues Wearing Sports Gear & Seasonal Clothing? 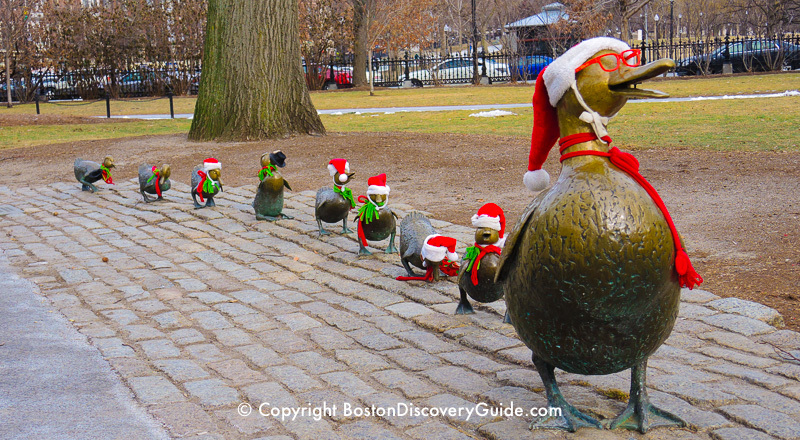 Make Way for Ducklings statues dressed in Santa outfits - Imagine how cute they will look in New England Patriots shirts! Our local tradition of putting sports gear on the many statues around the city should be in full display as the New England Patriots head to the Super Bowl! Without a doubt, the Make Way for Ducklings statues located in the Public Garden near the entrance at the corner of Beacon and Charles Streets should get an award for being the cutest statues wearing Pats gear. Among all the statues dotting the city, the Ducklings tend to be the most likely to be dressed up. Last year, the adorable ducklings appeared on Super Bowl Sunday morning attired in "Gronkling" t-shirts made by a Boston shirtmaker to honor Patriots tight end Rob Gronkowski. Sightings of other appropriately dressed Boston statues usually start to be reported on Twitter and Instagram throughout Super Bowl day. Another likely candidate in the Public Garden, near the Arlington Street entrance, is the George Washington on horseback statue. 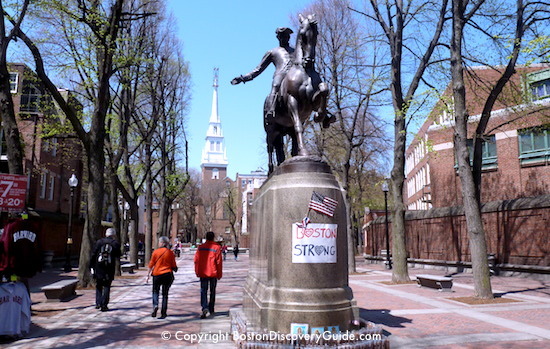 Likewise, the statue of Paul Revere - another Revolutionary War hero on horseback - located in "The Prado" (a.k.a. "Paul Revere Mall") off of Hanover Street in the North End also sports team clothing fairly often. 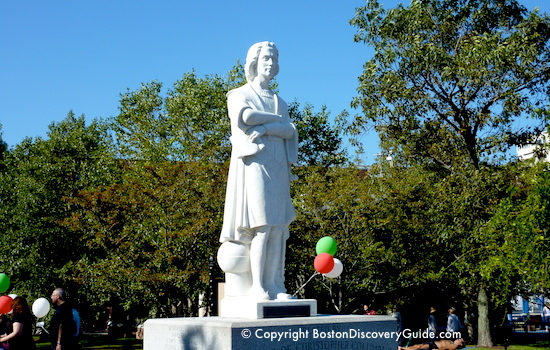 The Revere statue is definitely worth checking out because if he is not wearing anything photo-worthy, you can always console yourself with a cappuccino and cannoli in one of the bakery/cafes along Hanover Street - and then move on to other clothing-worthy statues. 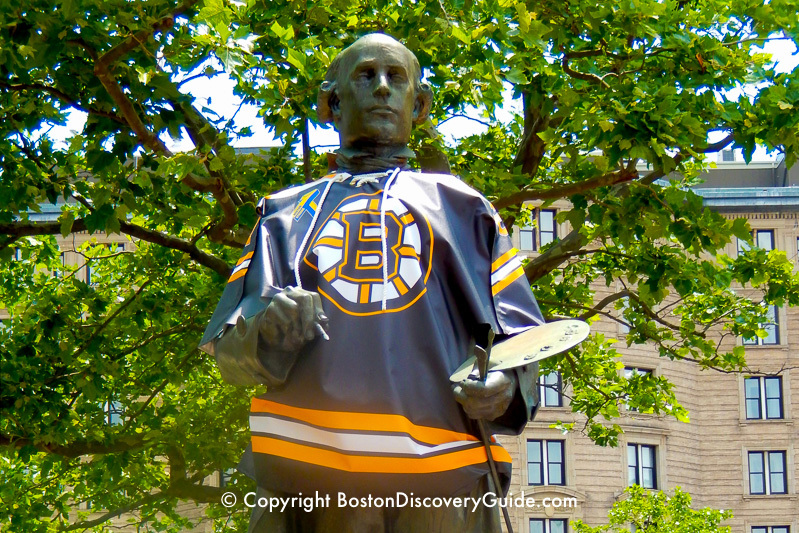 This statue of John Singleton Copley, famous 19th century Boston artist, presides over Copley Square and looks especially spiffy in this Bruins shirt. This central business and shopping hub in the Back Bay neighborhood attracts lots of locals and visitors. The Copley statue may be a likely candidate for wearing Patriots gear on Super Bowl Sunday. At the southern edge of the North End in Christopher Columbus Park is the magnificent Christopher Columbus statue overlooking Boston Harbor. 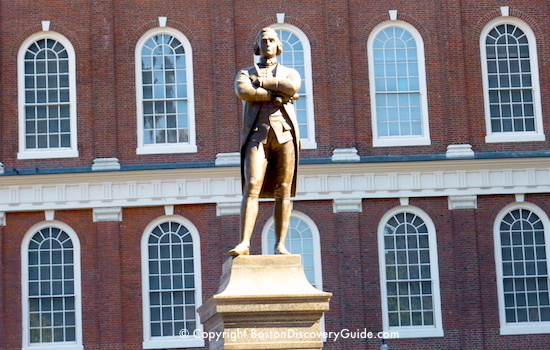 From the North End, you can easily walk across the Greenway to Faneuil Hall and check out the statue of Samuel Adams. As one of the leading Sons of Liberty who plotted against the British before the Revolutionary War, Adams certainly qualifies as a true Patriot - and deserves some Patriots gear. 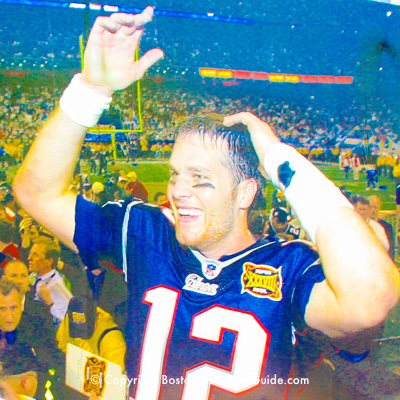 Of course, Boston has plenty of other statues that might look good wearing New England Patriots shirts: for example, likely statues abound in the Public Garden, Boston Common, Faneuil Marketplace, and the Massachusetts State House grounds. And don't forget the rather eclectic collection of statues - for example, Leif Erikson and General George Patton - along Commonwealth Mall in Back Bay and on the Esplanade. Most tempting, of course, are statues of sports figures belonging to other Boston teams, such as the Ted Williams and The Teammates (Dom DiMaggio, Johnny Pesky, Bobby Doerr) statues at Fenway Park. There are even rumors that the Bobby Orr statue in front of TD Garden may be wearing a Tom Brady "12" shirt this year. Other possibilities include Boston's many animal statues - the little donkey in front of Old City Hall on the Freedom Trail, and the Tortoise and Hare statues by Nancy Schön (also the creator of the Ducklings statues) in Copley Square. In sorting through my photos, I was shocked to discover I don't have any Boston statues wearing Patriots gear - so you've inspired me to go out with my camera on Super Bowl Sunday afternoon!